I quickly made these fun, textured buttercream cakes with a few everyday tools from my cake kit. 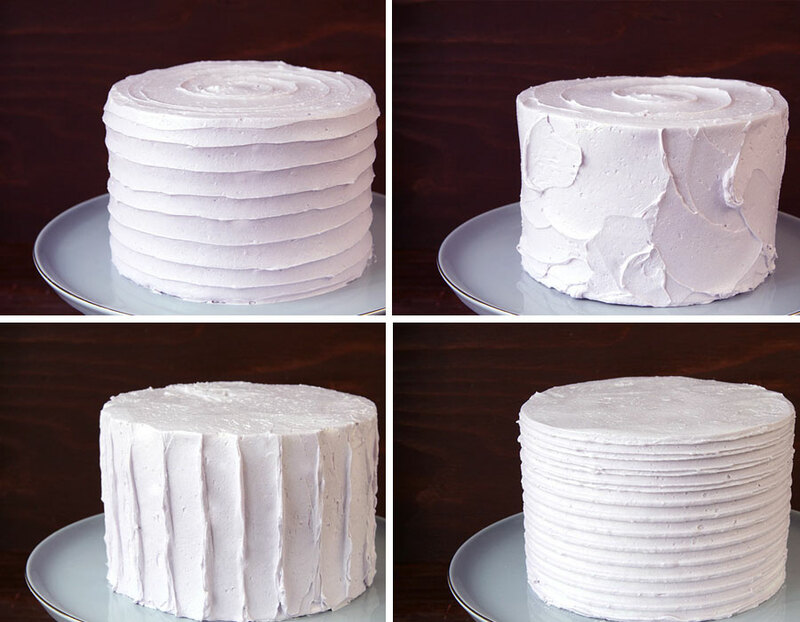 Starting with a fairly smooth, evenly iced cake, I changed up the look with these easy tricks. This effect reminds of subtle waves and ribbons. Holding a metal spatula perpendicular to the turntable, place the tip of the spatula to the bottom of an iced cake. While spinning the turntable, carefully spiral the spatula around the cake by moving the spatula up the height of the cake. "Push" any excess frosting over the edge of the cake and finish off the top with a spiral. Using a spoon, drag the rounded side up the height of a smoothly iced cake. Use the width of the spoon to create the ridges that define the stripe. A regular, teaspoon size should suffice on any medium-sized cake. Continue around the entire cake and finish off the top by pulling in any excess frosting on the top edge. The opposite side of my cake smoothing tools is ridged. While holding this "comb" portion perpendicular to the turntable, gently touch the ridges to a smoothly iced cake. Spin the turntable while keeping the comb still. Finish off the top by pulling any extra icing towards the center of the cake. If the ridges on the cake start to clump or become undefined, make sure your icing is not too thick and clean the comb between spins. Although this texture might look effortless, there is some strategy behind it. I always start with a semi-smooth finish to make sure there is an even layer of icing on the cake. You will want it to look rustic and "home-made," but not messy. Once the buttercream is already evenly applied, use a small off-set spatula to give it some natural-looking swirls and strokes. Finish off the top with a clean, fun spiral.